Born in Toronto, Ontario on 24 November 1875, the son of Arthur Wellington Ross and Jessie Flora Ross, he came to Winnipeg with his parents in June 1877. He was educated here, and later in Vancouver (1886 to 1889) and Upper Canada College in Toronto (1889 to 1892). From 1893 to 1895, he was junior partner with the brokerage firm of A. W. Ross & Co. in Toronto, and a partner in Fox & Ross of Toronto (1895). 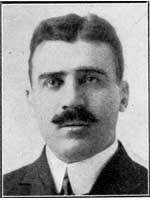 He returned to Winnipeg in 1894 and founded the Hugo Ross Realty Company Ltd. In 1903, he was a founder of the Winnipeg Real Estate Board. He was also president of the general insurance agency Ross-MacMillan-Knight. He served as secretary-treasurer of the Winnipeg Stock Exchange and president of the Winnipeg Real Estate Exchange at various times and was a director of other companies as well. He was an active clubman and yachtsman. He lost his life on board the Titanic on 15 April 1912. He is commemorated by Hugo Street in Winnipeg, and there is a plaque dedicated to his name in Winnipeg City Hall. There is also a memorial to him at Mount Pleasant Cemetery in Toronto. We thank Jason Tiller for providing additional information used here.